I like having a fullsize spare tire to rotate into the mix so all tires are the same. This does mean the spare tire will take up more room in the factory location - inside the cargo area. 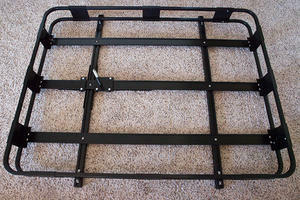 I opted to install a safari rack to carry the tire, recovery gear, and anything else I want. The original tires on the Jeep were not the greatest for my needs. 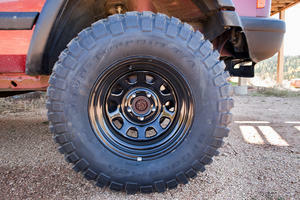 Because I intended to drive this vehicle primarily offroad, I opted to purchase some good offroad tires. 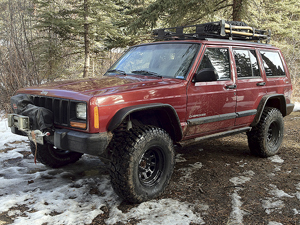 The selected kind was 31x10.50R15 BFG Mud Terrain KM2. You never know what will happen while trekking the mountains and this is why I like to carry a Maglite flashlight in the Jeep. In order to keep it from rolling around, I've mounted it in a convenient location.